Morphett Vale Pumper | SA Volunteer Fire Fighters Museum Inc. 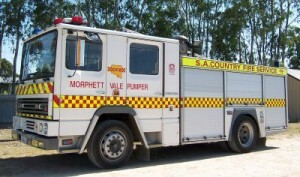 This appliance has been donated to the Heritage Committee by the CFS after ceasing service with the Morphett Vale CFS. Mount Barker in March 2005 after arriving in Australia from England via a refurbishment in New Zealand. In March 2007 it was transfered to Seaford CFS where it remained until moving on in July 2010 to Morphett Vale CFS.